What are Inflamed Taste Buds? Taste buds, as the name suggests are tiny sensory organs that help individuals to differentiate between various tastes. They are present on the surface of the tongue but cannot be seen by the naked eye. Papillae are small bumps inside which the taste buds are found. Sensory cells present in the taste buds connect them to the nerve fibers that send messages to the brain while eating and thus aids in identifying the taste of the food. The taste buds are extremely small and usually go unnoticed. However, sometimes they may swell and irritation could occur due to allergic reactions that cause inconvenience while eating, drinking and talking. This condition is referred to as Inflamed Taste Buds. Circumvallate Papillae: They are 10 to 14 in number and present at the base of the tongue. Filiform Papillae: They have the largest numbers that are thin and long. Fungiform Papillae: They not only help in tasting but also in detecting temperature and touch. They are found at the edges and tip of the tongue. Foliate Papillae: It contains hundreds of taste buds and is present at the back edges of the tongue. Injuries: The tongue is susceptible to cuts and lesions due to contact with sharp teeth, ill-fitting dental appliances, etc. Moreover, tongue bites may occur unintentionally while talking or chewing. The pain and irritation of the injury are accompanied by swelling of the taste buds. Tongue lacerations and head injuries are other common sources that can cause trauma to the tongue. Allergic Reactions: People may be allergic to certain food items. Hence, when they ingest such food, the body produces white blood cells in response to the allergens. This increase in the production of white blood cells triggers an inflammation of the taste buds. Mouthwash: Using a mouthwash regularly helps to maintain oral hygiene. However, sometimes the chemicals that they contain are too strong and can irritate the tongue. As a result, the taste buds become enlarged and inflamed. Spicy Food: Food which is too spicy or hot can cause inflammation of the taste buds. The acid content in such food items is higher than usual which causes discomfort. Moreover, if the individual has lacerations or cuts on the tongue or inside the mouth, it can cause a painful burning sensation. Infection: Infections caused by bacteria, virus or fungi can affect the oral cavity. One of its effects is that it makes the tongue swollen and red. Vitamin Deficiency: Deficiency of certain vitamins in the body could lead to inflammation of the taste buds. Low levels of iron in the body make the tongue swollen and become red. Other important vitamins include vitamin B-12, B complex, and folic acid. 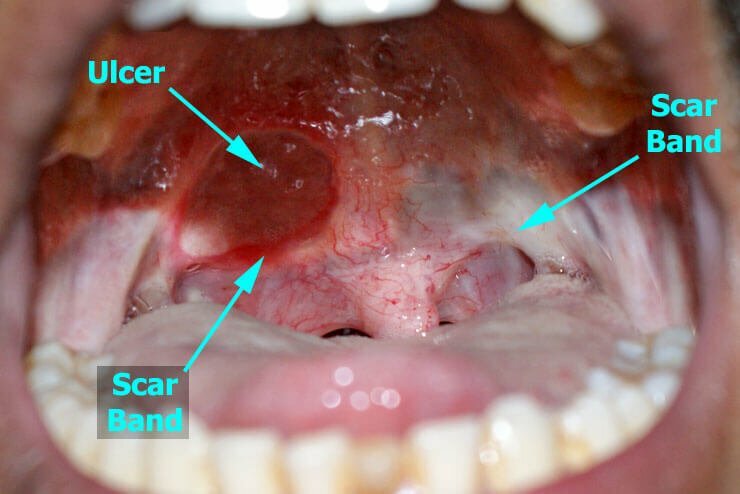 Oral Cancer: People who have oral cancer also have swollen taste buds that are present on the sides of the tongue in case of cancer and a lump is also observed on the tongue. Stress: People who suffer from high levels of stress or anxiety have swollen taste buds. The papillae become enlarged, and the person experiences discomfort. Smoking and Alcohol: Smoking tobacco and consuming high amounts of alcohol can cause the inflammation of taste buds. It happens because both alcohol and tobacco have toxic content that irritates and inflame the sensitive taste buds on the tongue. Acid Reflux: Gastroesophageal reflux refers to a condition in which the acid in the stomach makes its way back to the mouth. The acid can burn the papillae and result in its swelling. Chemotherapy: People who have oral cancer and use chemotherapy to treat the condition are prone to swollen taste buds. The radiation used to treat cancer also destroys the mucous membrane. Quit smoking and Alcohol: The toxic contents in tobacco and alcohol cause swelling of the taste buds. Such habits should be avoided and taking nicotine supplements may help to quit smoking and reduce alcohol consumption. Gargle: Gargling with a mixture of salt and warm water thrice a day will be beneficial in preventing swollen taste buds. Oral Hygiene: Maintaining good oral hygiene by regular brushing and mouthwash is essential. It lowers chances of infections and lesions that could lead to inflammation of taste buds. Avoiding spicy food: Spicy food contains high levels of acid that can irritate and cause discomfort to the taste buds. The taste buds are extremely sensitive and may get burnt. Thus, this kind of food must be consumed in limited quantities. Hydrate: Dehydration produces a condition of the dry mouth and may cause swelling of the taste buds. If water is consumed in adequate amounts, the body gets hydrated which further helps to reduce inflammation. Ice: Ice can help to reduce the swelling. However, leaving the ice on the tongue for too long can cause further damage. Tea Tree Oil: Mixing a few drops of tea tree oil with warm water and gargling can reduce the swelling of the taste buds. Saltwater: Rinsing one’s mouth with salt water removes bacteria and infectious material from the mouth and limits germ build up in the mouth. Honey: Honey can be applied on the tongue to reduce the swelling and irritation. Honey also has anti bacterial qualities that help to treat the condition faster. Baking Soda: Baking soda helps in neutralizing the gastric acid present in the area which reduces the swelling and restricts further swelling of the taste buds. Swelling of the taste buds is not a serious problem but is a condition which can heal on its own. However, if the condition does not heal within a stipulated period, then a doctor should be consulted. Moreover, if the individual experiences symptoms of oral cancer along with inflamed taste buds, then they must seek medical help.